Advanced Managed Services New Access experienced professionals to architect, optimise and elevate operational governance for Hybrid IT environments. Platform Advisory Support New Bring your own cloud, or buy AWS, Azure, Dedicated Cloud Compute and CenturyLink Cloud through one centralised platform for simplified billing and account management. Firewall Secure your cloud infrastructure with a dedicated, customisable firewall. Apache Tomcat On-Going support and maintenance for your Java-based web applications. Permissions/Roles Select access settings for authorised users. Data Analytics Realise critical insights from your data to drive digital transformation. Create highly-configurable virtual servers and pay only for what you use. Access and control your cloud servers through our fully integrated web-based interface or via API. Execute power operations, assign IP addresses, set up monitoring and alerts, view activity history and more. Create on-demand high-performance cloud servers with any combination of operating system, CPU, memory and storage. 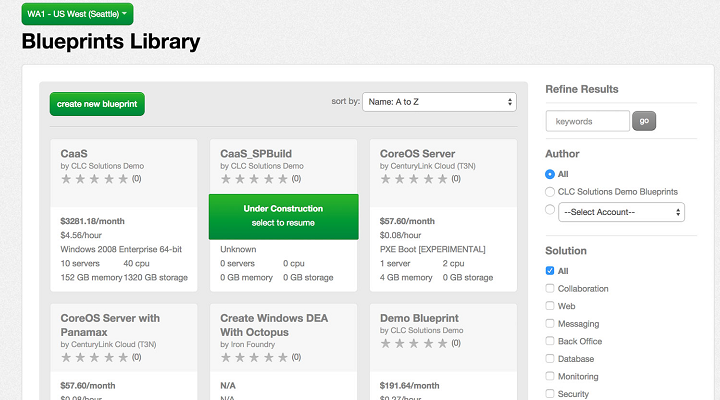 You won't be locked into rigid, one-size-fits-most virtual machine sizes. Powerful scheduling tools to automate and complete cloud server admin jobs — to individual machines or Groups of VMs — or define and apply alert policies to be notified if and when actions should be taken. Deployment complexity runs the gamut — from running a simple script on one or two servers, to repeatedly installing Active Directory Domain Services on Windows Server 2012. Our Cloud Blueprints and Runner cloud automation service reduce the opportunity for error and greatly simplify the process. Create CPU, memory or storage alert policies, apply them to individual cloud servers or logical Groups. 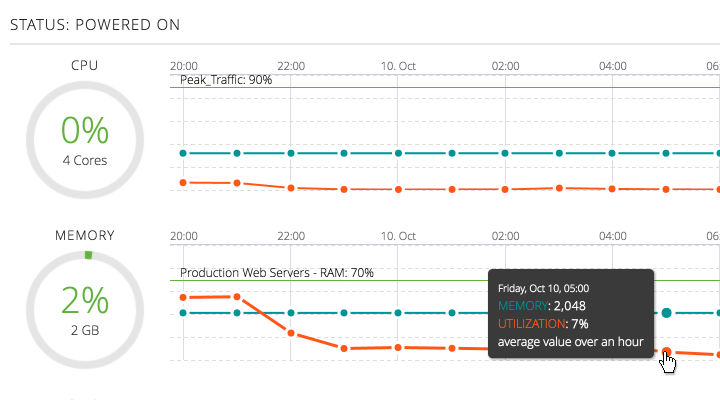 Consume alerts in three ways & email, webhook, or from the Control Portal web interface. Notifications allow you to respond before trouble sets in. 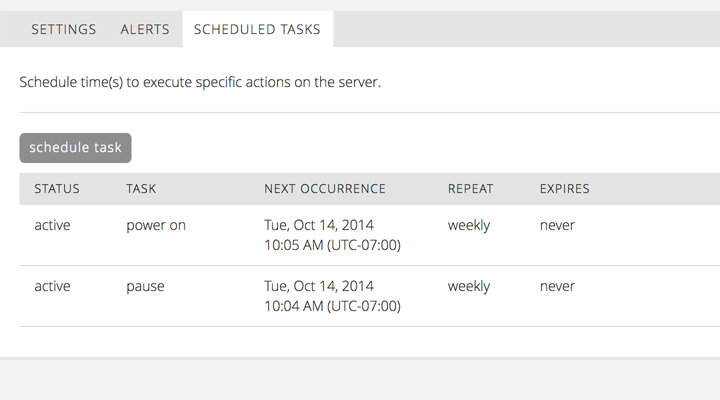 With Scheduled Tasks, you can automate and coordinate maintenance activities, turn off developer machines over the weekend, or automatically delete or archive servers at the end of a project. Take a snapshot of any cloud server (or Group of servers) when you reach a milestone to allow a server to be quickly reverted back to a set point in time. You can even set up snapshots to be taken at scheduled intervals, as well as control retention duration, up to 10 days. View our reference architecture guide for building highly available and scalable web applications using CentyuryLink cloud servers. CenturyLink's Relational Database service – Relational DB – makes it easy to deploy a MySQL-compatible database on our cloud. 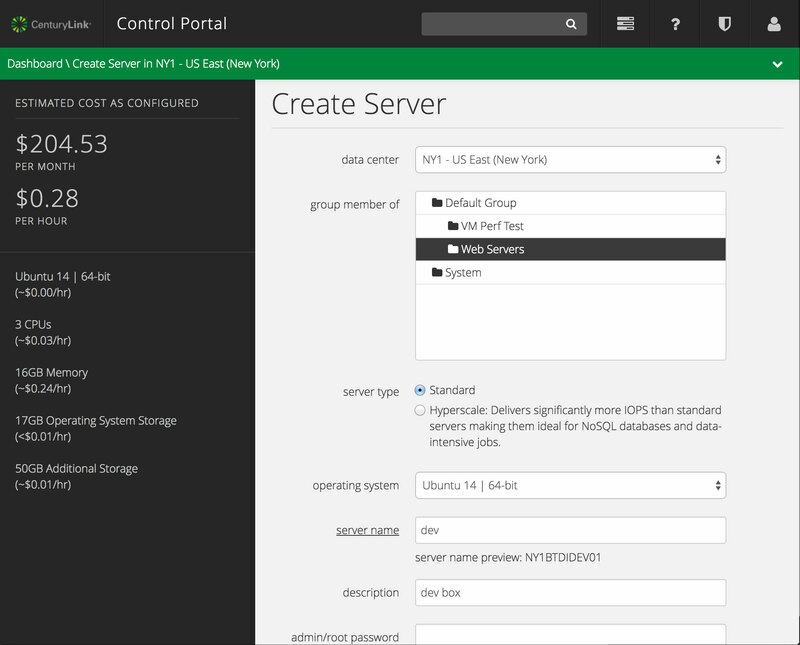 Set up server Groups to organize, administer and manage multiple servers as a single unit. 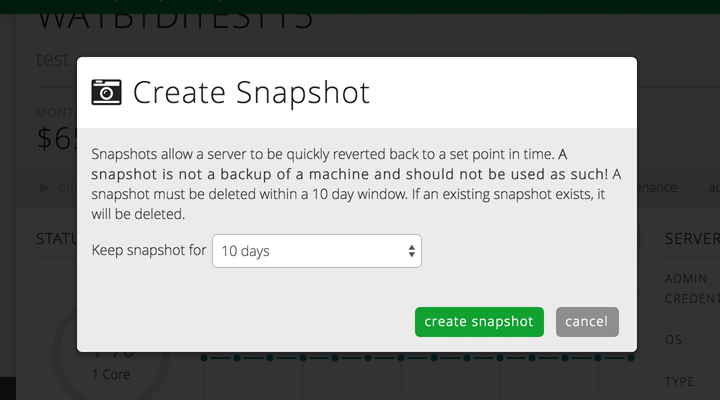 Server snapshots can be taken at scheduled intervals and let you to quickly revert a cloud server back to a set point in time. Create your own baseline OS templates for cloud servers, including customized builds, software packages, security templates or other components. CenturyLink Cloud offers built-in “defense in depth” security. Deploy Patching-as-a-Service to automatically patch your cloud servers. Ideal for longstanding VMs and mission-critical workloads. Our platform is SSAE 16 SOC2 Type 2 certified, and we’ve helped customers comply with industry regulations like HIPAA, PCI DSS and ISO27001. Our cloud infrastructure is optimised across the stack for high performance - from premium hardware to custom performance enhancing technologies. 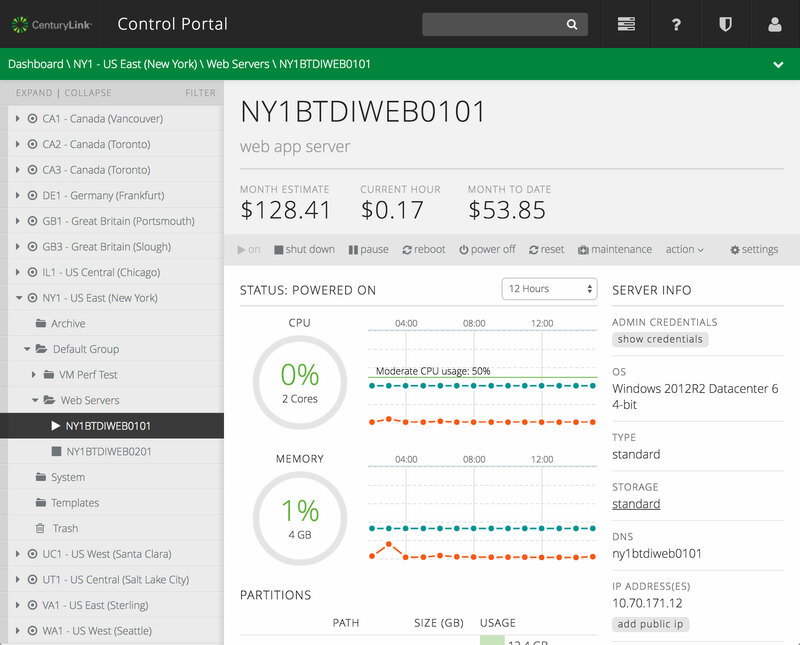 We include powerful built-in redundancy features that improve uptime – all included in the cost of your cloud servers. Reinforce your solution with services such as shared or dedicated load balancing for maximum uptime. Build cloud servers to meet your specific requirements, rather than choosing from a rigid set of pre-configured options. Our servers are consumed and billed on an hourly basis - no contract required. So you can scale up or down as best makes sense for your development, testing or production requirements. The following products are available for customers with advanced requirements. They may be added to a single cloud server or Groups of servers. Contact us for a custom quote. CDN CDN delivery services from multiple providers. Appliance instance. Different sizes are available. Cloud servers are perfect for high-growth or seasonally dynamic computing scenarios. CenturyLink Cloud's lighting fast deployment, autoscale (both horizontal and vertical), all-utility billing, and Group management features all position your business for growth. And you can just as easily power down unnecessary resources at the click of a button, so you only pay for what you need. Business today operates on a global scale, and cloud computing makes that happen. With our public cloud available in multiple data centers around the world, you can establish a geographically-friendly presence wherever your customers are. This means not just reduced latency and a better user experience, but also a real demonstration of your commitment to that geography. As organizations recognize the need to respond more and more quickly to market pressures, Agile Development is becoming the norm. Development and testing environments need to be spun up fast, and decommissioned just as quickly so as not to consume precious IT OpEx or CapEx budgets. 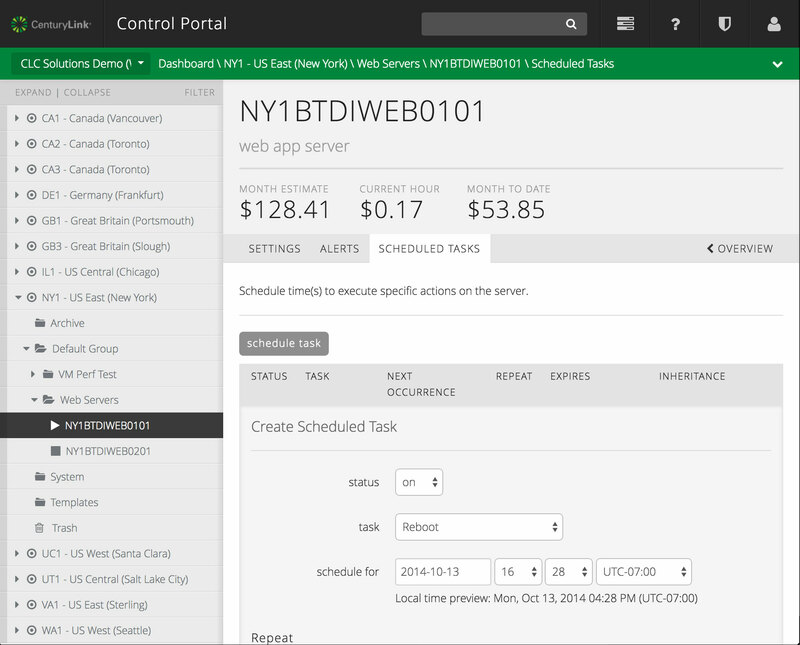 CenturyLink Cloud servers are perfect for Dev/Test, with fast and easy deployment and pay-as-you-go utility billing. Analysts claim unexpected downtime can cost organizations as much as $300,000 per hour. Regardless of the size of your organization, designing your IT infrastructure for high availability is fundamental to your success. Cloud technologies create easy access to load balancing, autoscale and disaster recovery features that can be much more difficult to implement in traditional IT environments. Persistent storage. Price per GB. Resources charged hourly, monthly estimates based on 720 hours. Does not include operating system/software licencing. CenturyLink shall, insofar as is possible, promptly notify Customer of any enquiry, complaint notice or other communication it receives from any supervisory authority, or from any Data Subject relating to the Services (including any requests to access, correct, delete, block or restrict access to their Personal Data or receive a machine-readable copy thereof) and, insofar as is possible and to the extent technically feasible, assist Customer with its obligation to respond to any notification or Data Subject rights request in accordance with the timescales set out in the Data Protection Laws. Data Exporter: The Data Exporter is Customer, a business customer of the Data Importer that is domiciled in the United States and that processes personal data in the ordinary course of its business, and that desires to obtain processing services, as authorised by its Affiliates in the EEA and their respective branches who are controllers based in the EEA. Processor operations: The Data Importer will, through authorised personnel, perform the following processing services: cloud hosting and communications services as may be individually ordered by Data Exporter and as more fully described in service orders, service exhibits and similar contractual documentation. CenturyLink has implemented the data security measures described in this Appendix and shall maintain them, or an equally secure equivalent, during the applicable term of the Services. These measures generally apply to CenturyLink's standard services and certain measures may not apply or may be applied differently to customised services, configurations, or environments ordered or as deployed by Customer. These measures have been implemented by CenturyLink to protect, directly or indirectly, the confidentiality, integrity and availability of Customer Data. As used in this Appendix, "Customer Data" means any data, content or information of Customer or its end users that is stored, transmitted, or otherwise processed using the CenturyLink Services. COMPLIANCE WITH LAW, AUDIT REPORT. CenturyLink has adopted and implemented a corporate information security programme as described below, which programme is subject to reasonable changes by CenturyLink from time to time. CenturyLink has completed an AICPA sanctioned Type II audit report (SSAE18/ISAE3402 SOC 1 or SOC 2) for certain facilities/services and will continue to conduct such audits pursuant to a currently sanctioned or successor standard. Customer will be entitled to receive a copy of the then-available report upon request, which report is CenturyLink Confidential Information. Customer may make such report available to its end users subject to confidentiality terms provided by CenturyLink. Customer will ensure that all Customer Data complies with all applicable laws and appropriate information security practises, and nothing herein shall relieve Customer from its responsibility to select and implement such practises. INFORMATION SECURITY PROGRAMME. CenturyLink has implemented an information security programme (the "Programme") that includes reasonable measures designed to: (1) secure the confidentiality and integrity of Customer Data; (2) to the extent related to the Services and CenturyLink infrastructure, protect against foreseeable threats to the security or integrity of Customer Data; (3) protect against unauthorised access to, disclosure of or unauthorised use of Customer Data; and (4) provide that CenturyLink employees are aware of the need to maintain the confidentiality, integrity and security of Customer Data. CenturyLink will limit access to Customer Data to only those employees, agents, contractors or service providers of CenturyLink who need the information to carry out the purposes for which Customer Data was disclosed to CenturyLink. Network security controls, including the use of firewalls, layered DMZs, and updated intrusion detection/prevention systems to help protect systems from intrusion and/or limit the scope or success of any attack or attempt at unauthorised access. Approved anti-malware software is installed on CenturyLink equipment capable of running it where the risk of infection is high. It is configured to prevent users disabling the software where possible or altering its configuration without authorisation. Periodic evaluations are performed to confirm whether systems continue to require (or not) antivirus software. Dedicated organisations with global responsibility for all physical security operations, security systems, access administration, and security controls within all CenturyLink-owned facilities and data centres. Third-party data centres are utilised for certain services and, in such cases, certain physical security and other controls are reviewed by CenturyLink. CCTV (Closed Circuit Television) commonly deployed as a physical security control in high value facilities to deter, detect and identify intruders. The Corporate Security Operations Centre (CSOC) provides global, 24/7 support with remote monitoring, management, administration and maintenance of the CCTV video surveillance systems used throughout CenturyLink. The Central Access Control Centre (CACC) supports the distribution of all CenturyLink access badges and administration of access permissions within the access control system. Pre-employment screening and background checks are conducted on incoming personnel in accordance with CenturyLink human resource on-boarding practises and applicable local law. The checks are dependent on, amongst other things: the role, location, any custom requirements, and can include: identity, drug, criminal, academic and credit checks. Annual security awareness training for CenturyLink employees and contractors working on CenturyLink premises. The training reflects current threats and encourages basic security good practise, access to and knowledge of Information Security Policy and procedures such as how to report an incident. Employees in particular positions receive supplementary security training and if a training or testing issue arises (e.g., internal phishing exercises), further guidance is provided. CenturyLink conducts a continuous programme of phishing tests on staff to reinforce the requirement for awareness and good email and browsing habits and to assess the effectiveness of security awareness training. The company intranet and email system are used to disseminate flash announcements on security matters as appropriate. SECURITY AUDITS. Customer may, no more than once per year and at its own expense, audit CenturyLink's performance with respect to its security obligations under this Appendix ("Audit"). In the event Customer retains a third party to perform an Audit, CenturyLink may require additional documentation be executed by the third party auditor prior to granting access to a CenturyLink facility where Services are provided, and CenturyLink may, at its sole and reasonable discretion, decline to allow a third party access to a data centre. CenturyLink shall reasonably cooperate with Customer in its performance of the Audit and shall make available to Customer or its auditors documents and records reasonably required to complete the Audit. CenturyLink shall provide Customer with reasonable access to the relevant facility for the purpose of inspection of the equipment and facilities which are used to provide the Services to Customer. For purposes of clarification, access will not be granted to certain areas of certain facilities (such as data centres) to which CenturyLink does not generally allow access to its customers (e.g. areas which house equipment used to support services for multiple customers). Audit access is subject to CenturyLink's reasonable security requirements for its most sensitive security policies/materials. Audit access must be within CenturyLink's normal business hours and must be scheduled at least ten (10) working days in advance, and Customer or its auditor shall be escorted by CenturyLink personnel during the period of access. The Audit and any findings related thereto shall be treated as Confidential Information. For purposes hereof, "Security Incident" means any unlawful or unauthorised access, theft, or use of Customer Data while being stored, transmitted or otherwise processed using CenturyLink services.